Trim venison saddle and cut it into 200 g portions. Add crème de cassis to a small saucepan and slowly heat on the side. In a bowl, mix breadcrumbs with grated Parmesan cheese. Add rosemary, thyme, sage, slivered almonds, and mix of Parmesan cheese and breadcrumbs to a blender and pulse. Add egg yolks and blend again. Transfer herb-crust blend to a bowl and set aside. Heat olive oil in a frying pan and add rosemary and garlic. Add more olive oil, if desired. Season venison saddle with salt and pepper. Transfer venison saddle to the frying pan and sear for approx. 2 – 3 min. on each side, or until a crust has formed. Allow to rest for approx. 10 min. In the meantime, add sugar to a frying pan and wait until sugar has caramelized. Add chestnuts, toss in caramel and set aside. Let crème de cassis reduce to half its volume. If desired, mix starch with water and add to the crème de cassis to thicken. Add some more oil and egg yolk to the herb-crust blend and mix thoroughly. Form a crust and place venison saddle on top of it. Heat some butter in another frying pan, add rosemary, garlic, and venison with herb crust. Sear again briefly, covering the venison with butter, rosemary, and garlic. Remove venison from crust and flip, sear again, then remove venison saddle, herb crust, and rosemary from the pan. Heat olive oil in a frying pan. Add rosemary, garlic, and porcini mushrooms. Sauté for approx. 2 – 3 min. and season with salt and pepper. Add blueberries and sauté for 1 – 2 min. more. 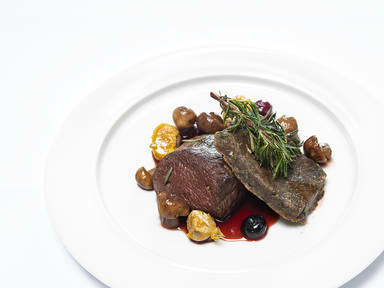 Place reduced crème de cassis on a serving plate, add venison and herb crust on top. Serve with porcini mushrooms, blueberries, and caramelized chestnuts and garnish with rosemary. Enjoy!